It's not as flexible as the rollable screen from Polymer Vision, but it is a step in the right direction. LG announced this morning that they're about to start mass production of a new E-ink screen. This screen is promised to be more durable than anything currently on the market and it can flex at an angle of up to 40 degrees. So how does this differ from older E-ink screens? LG buys the screen source material from E-ink in giant rolls. They then cut out the 6" screen size and mount it on their own backplane. With the screen mentioned above, it's the backplane that is flexible. That is also why this screen is more durable than past E-ink screens, which had a glass backplane. On a related note, I'm pretty sure I already showed you the new screen. NextPapyrus has been working on an ereader that uses this new, more durable screen with this resolution, and I've posted on it once or twice. The LG screen mentioned above is likely the same screen being used by NextPapyrus. And it is durable. A few weeks back NextPapyrus posted a Youtube video showing the screen being repeatedly hit by baseballs. It survived. The new screen is going to have the same resolution ( XGA , 1024x768) as on LG's current E-ink screen, which is being used on the iriver Story HD. LG is planning to have it on devices in the European market next month. Seoul, Korea (March 29, 2012) – LG Display [NYSE: LPL, KRX: 034220], a leading manufacturer of thin-film transistor liquid crystal display, announced today that it has started mass production of the world's first plastic electronic paper display (EPD) for use in E-Books. The 6" XGA (1024x768), e-ink, plastic EPD is expected to revolutionize the E-Book market with its advancements in functionality and design. "With the world's first plastic EPD, LG Display has once again proven its reputation for leadership and innovation with a product we believe will help greatly popularize the E-Book market," said Mr. Sang Duck Yeo, Head of Operations for LG Display's Mobile/OLED division. "Based on our success in mass-producing plastic EPD, we are excited as we look toward applying concepts from this experience to future developments like plastic OLED and flexible displays." The world's first plastic EPD from LG Display offers users a paper-like reading experience with a plastic substrate that is as slim as cell phone protection film, and a flexible design that allows bending at a range of 40 degrees from the center of the screen. Compared to glass EPD of the same size and resolution, LG Display's plastic EPD realizes a super slim thickness of 0.7mm which is 1/3 slimmer than existing glass EPD; as well as a weight of 14g which is more than 1/2 lighter. E-Book users have long expressed a desire for more durable EPD, since around 10% of them have damaged their product screens from accidentally dropping or hitting them. When LG Display's plastic EPD was put through repeated drop tests, from 1.5m above the ground or the average height of reading when standing, no damage resulted. When put through a break/scratch test involving hitting the display with a small urethane hammer, no scratches or breakage resulted. As EPD gets thinner, lighter, and more durable with the introduction of plastic EPD, E-Books will be able to offer certain unique benefits compared to smart devices and tablets, including reduced eye fatigue and more efficient electricity consumption in addition to lower prices. LG Display developed a unique technique to utilize the high TFT process, typically employed in general LCD manufacturing and with temperatures exceeding 350 degrees, in the production of its plastic EPD. By overcoming the obstacles associated with applying the existing production process to heat susceptible plastic, LG Display achieved a breakthrough with the successful mass production of plastic EPD able to maintain strong durability in high temperatures. The world's first mass-produced plastic EPD from LG Display will first be supplied to ODM companies in China, followed by completed products to be released in Europe at the beginning of next month. What the market needs is durable screen more than rollable screens. Idealy in color so you can use them for three year-olds. But B&W is a good start indeed. It’ll enable even lighter readers so maybe we’ll see 10 in eink readers in the 6 ounce range or lower. What matters most is refresh, reflectivity, and contrast. I can’t tell if that backing is more or less gray than current eInk. And does it do — or need — full-screen refresh like eInk? It sounds like they are using Pearl film from eink so it should not be terribly different from existing Pearl screens, just more durable. It is Eink film. They purchase the EPD film material from Eink. Then combine it with their own backplane technology to produce a working display. This will be built using the newest generation higher DPI Pearl(“HD”) film that they were already using for the Story HD , Hanvon E920 etc. From reading it seems they have managed to overcome the previous manufacturing heat issue related to making plastic substrate displays faced by themselves and PVI. Because of the heat issue PVI had been attempting to build the display on glass and then slice it off and laminate it to the plastic. Hit by golf balls not baseballs. 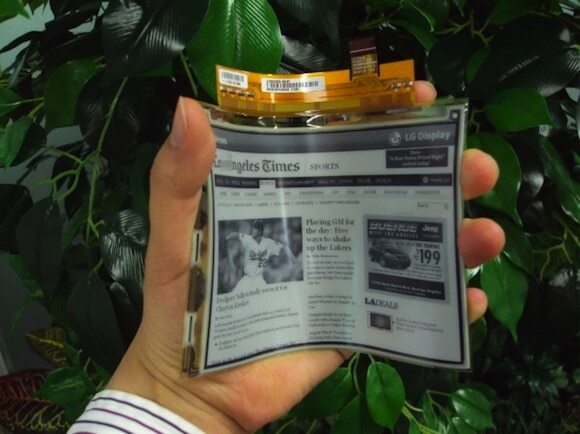 “has started mass production of the world’s first plastic electronic paper display (EPD) “….. by LG. first poduced by LG. Since Plastic Logic has been delivering the 100 reader to russian class rooms since last September, they would be the worlds first company to mass produce and deliver entirely plastic displays in working consumer devices. Nice. My wish: make the eInk-foil 1-2cm larger than the backplane so that it covers the complete front of the reader. No shadow-casting frame between display area and the outside frame – it would look like a regular page of paper (and the ePub etc could use the whole 1024×768 for content – no need for margins any more). Put it in a case that looks like a hard-cover book and the thing is sold. So will Wexler http://the-digital-reader.com/2012/02/26/wexlers-flexible-ereader-shows-up-at-ifa-video/ be first to market with a device then? I just get a sinking feeling whenever I see something this cool- the vaporware vibe.